When you think of working out, there’s a good chance running, weight lifting, spin class and boot camp come to mind. But what about water workouts? The pool is one of the best places you can go to get an overall cardiovascular workout that’s also gentle on your body — especially this summer season. Simply put, water workouts are any cardiovascular or conditioning program you can do in the pool. The workouts are made for any fitness level and are easy to customize or adapt to specific health conditions or injuries. Plus, you can do these workouts with or without equipment. If you choose to add resistance, some of the more common ways to up the intensity of your workout are flotation belts, kickboards, water weights and pool noodles. As far as the types of classes or workouts to choose from, the possibilities are endless. Aqua cycling, deep-water running, shallow-water boot camp and circuit-format group exercise classes are just a sample of what’s available. One of the more popular water workouts is aqua jogging, or deep-water running. Performed with a flat belt around your waist, Aaptiv trainer Ed Hall tells SheKnows that this exercise mimics running in water but with the toes pointed to help keep your head above water. It is ideal for maintaining an aerobic base without the impact of running on land. What are the benefits of water workouts? 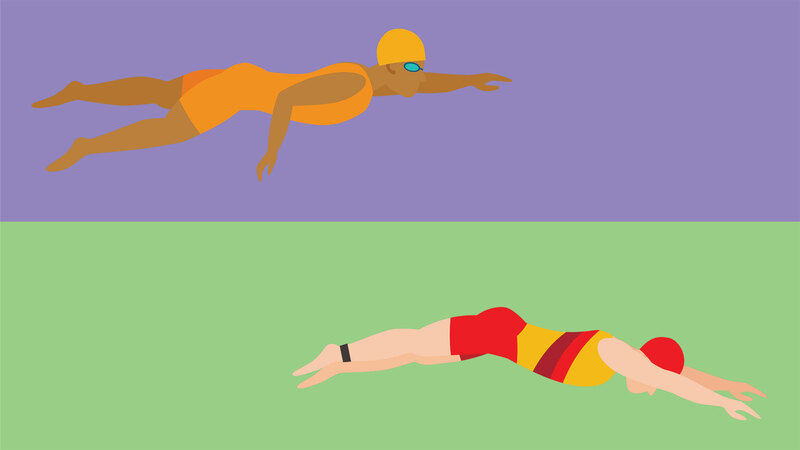 Bet you didn’t know that swimming is the fourth-most popular activity in the United States. Water workouts have been around a lot longer than some of the current fitness trends, and they don’t appear to be dying down anytime soon. In a 2007 study published in the Journal of Cardiopulmonary Rehabilitation and Prevention, participants reported that they enjoy exercising in the water more than on land. Plus, you can exercise longer in the pool since the water protects your joints and muscles from a lot of the pain you may experience running or in a boot camp-type of class. “Water workouts are safe for most people, as the low- to no-impact movements and hydrostatic pressure can be therapeutic for those with injuries or other limiting factors,” certified personal trainer and AEA-certified aqua group fitness instructor Dr. Kelly Morgan, who has a Ph.D. in health communications, tells SheKnows. But water workouts are not just for people who need the pool to help them manage a health condition. Even the fittest will be challenged in the pool. Don’t believe us? Rather than hitting the pavement or pushing weight around for your next workout, head to the water instead. You might be surprised just how challenging a swimming-based workout can be. Which water workouts are the best? Though most types of movement — in or out of the water — are better than nothing and good for your health, some water workouts pack more of a punch than others. “Depending on your fitness goals, some types of water workouts will be better-suited than others,” says Hall. If you are a weightlifter, Hall recommends a shallow-water boot camp class that uses noodles, float boards and pool dumbbells because it works your muscle concentrically and not eccentrically (less gravity). This means you are less likely to get sore, you can work harder and get the most out of your workout. Classes that incorporate aqua jogging or pure water aerobics classes focus more on cardiovascular conditioning. But regardless of the type of workout you choose, Morgan says the benefit of exercising in the water is that the water resistance adds a strength-training element to all movement. Should you join a class or workout on your own? If you need that extra boost of motivation to work out or you’re looking for the social aspect a group class provides, joining a class may be right for you. However, there is no need to do water workouts as part of a large group. All the workouts you do in a class can be done on your own. If you’re new to swimming or water-based workouts, taking a few classes to familiarize yourself with the different exercises might be helpful. “Someone can demonstrate the types of exercise to do and how to perform them correctly and in the proper order,” Hall says. Then you can take what you learned in the class and create your own workouts. Knowing how to do a water workout will come in handy if you’re traveling or on vacation and need to use the hotel pool to exercise. So, the next time you think you can skip your workout because it’s too hot, try and find a pool and hop in — there are plenty of fun ways to exercise!